Here you can find a list of beginner and advanced tutorials that will help you develop content with the game engine Unity. If you want to add any tutorial to this list or find any outdated information, contact us. If you are just starting out with Unity, follow this list from top to bottom. Let's start by downloading Unity. This page will show you the available licenses for Unity and allow you to download the Unity version of your choice. This official Unity guide will help you install Unity on your computer, either with Unity Hub or through a Download Assistant. Unity Hub is the ideal tool to keep all your projects and Unity installations neatly organized. To jump straight to the free Unity Personal Edition download, visit this page: https://store.unity.com/download?ref=personal. Make sure you use the correct Unity version depending on your annual gross revenue. Unity Learn contains all learning materials produced by the team at Unity Technologies. Unity Learn is an excellent source for beginner and intermediate users alike and should be your first stop when you start out in Unity. https://unity3d.com/learn/tutorials is an extensive list of Unity tutorials sorted by projects and topics. Each tutorial provides project files, PDF slides, transcripts, videos and code snippets. Amazing! https://docs.unity3d.com/Manual/index.html If you prefer text-based tutorials, dive into the Unity Manual and explore topics ranging from installing the editor all the way to advanced development topics. https://connect.unity.com/events Interested in Live Sessions or local and online User Group Events? Check out Unity Connect. While not a Unity-authorized course, Ben Tristem and his team have created excellent, beginner-friendly video courses on Udemy, covering 2D and 3D Unity development in detail. Make sure to always purchase the course (or any Udemy course) at a discount of at least 80-90%. If the course is not discounted at the moment, use this link (we are not affiliated with this course). Jonathan Weinberger, an Authorized Unity Instructor, has created several Unity video courses on Udemy, including a highly-rated Portuguese Unity course. Again, make sure to purchase any Udemy course at a heavy discount. The VR Nanodegree on Udacity is a 6-month program that teaches a lot of the Unity Basics and additional content relevant to virtual reality development. While it had a fairly rough start, the Nanodegree's content and student engagement seem vastly improved if the student reviews can be believed. Enrollment periods are available several times a year with waiting lists in-between. While this program is much more costly than other course alternatives in this section, it will earn you a certificate which arguably can hold more weight than a course completion on Udemy, especially with companies that directly promote this Nanodegree (i.e. Unity, HTC, Samsung, Google). If your only goal is to get a first glimpse of Unity development and some AR/VR exposure, other courses in this section might be a more affordable choice. The Unity-authorized course "Mobile VR App Development with Unity" on Coursera is an intermediate-level course taught by Peter Patterson. The course can be taken for free as "Audit-Only" or it can earn a Certificate for approx. $100. The monthly subscription service "Unity Game Dev Courses" is a co-creation of Unity Technologies and Pluralsight. For $12/month you get access to a series of tutorials and a sample project "Swords & Shovels" covering many topics of game development with Unity. 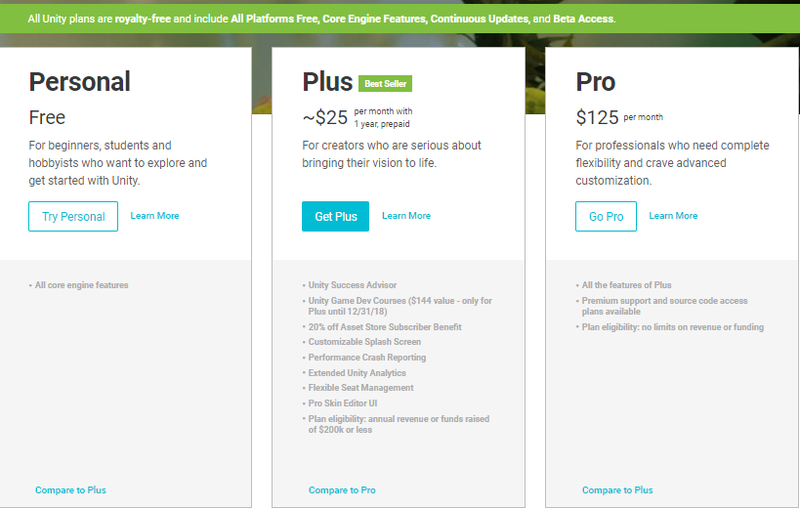 If you already own Unity Plus/Pro, you will gain access for free. For Unity Personal Edition users, the ongoing subscription costs and somewhat opaque content structure make this a less attractive offer compared to many lifetime-access courses that are of similar quality. Unity also offers its own paid Virtual Classes with a maximum class size of 20 and the opportunity for Q&A with the instructor. Classes are held four times a week over three weeks. GameTutor is a subscription-based site that offers tutorials for Unity and Houdini. The Unity tutorials are an interesting mix of topics including ScriptableObjects, UnityUI, XML, and building tools for the Unity editor. The selection of tutorials is somewhat limited, but production value of each tutorial is excellent. When browsing these sites for tutorials, it is important to check which Unity version is being used and when the tutorial was released. There is nothing worse than following a tutorial and getting lost because Unity's functionality changed over time. From this perspective, Udemy appears to be the most up-to-date learning platform for Unity, as most major courses update their content regularly. Also, Udemy arguably has one of the largest communities, making it easier to find fellow students who share a passion for learning Unity. Packt Publishing also has a large number of current video and book titles, but there is no community attached with forums, chat groups and Q&A sessions. Udacity content is available for free which sets it apart from the other providers. If you have questions or are stuck during development, there are several platforms that can provide answers. Unity Answers: Search this site and ask questions about Unity functionality and scripting. If you have longer, specific in-depth questions, Unity Forums might be a better choice. Unity Forums: The official place for Unity news, tutorial discussions, asset-specific threads, and basically anything Unity-related. This is the right place to post if you need help or simply want to discuss Unity topics with other community members. Unity Knowledge Base: This is a Q&A site from Unity's support team. It covers questions that you might not find anywhere else, including licensing, accounts, and various Unity services. Unity subreddit and Unity Tutorials subreddit: Well, it's Reddit, go figure. Stay civil! Video course communities: If you have signed up for a video course on a site like Udemy, you can ask questions in the discussion forums of each course. For larger courses, dedicated community members will answer your course-specific questions. xr.community: If you are totally stuck with anything Unity-related or you need help with VR, AR, MR projects, shoot us a message and we'll get back to you. Promise! There are a number of books available for teaching all aspects of Unity development. Similar to video courses, an outdated book can quickly become confusing, especially when the book guides the reader through example projects. More specialized books that cover individual topics such as shader programming or optimization, can be relevant for longer periods of time. The widest selection of Unity-related books can be found at Packt Publishing. Books can either be purchased individually or access to all (e)Books and videos can be purchased via a Mapt subscription for $30/month ($150 annually). There is also many niche books in Packt's library covering topics such as shaders, machine learning agents, optimization, audio, virtual reality and many others. One of the most highly recommended beginner books is Unity 2018 Game Development in 24h (Sams Teach Yourself) by Mike Geig. As a Unity employee, the author is also responsible for a lot of Unity's Learn tutorial content. There are a lot of parallels between Unity's tutorials and this book, both of which are excellent. Some readers might say that there is not much new content besides what is already covered in Unity's tutorials, but then again, some people just prefer learning with a physical book in which you can scribble and take notes in. Either way, the book in its third edition comes highly recommended. Video tutorials are the most common form of training content for Unity. This section contains videos that are not organized into full courses (see previous section), but rather contain individual topics and videos that explain features, concepts or projects in more detail. Let's start again with Unity's own content. Unity's YouTube channel contains a wealth of information, feature previews, and tutorials. Unite sessions covering new features, roadmaps, and technical deepdives can be extremely useful for anybody who cannot attend Unity's live events. Sykoo has a great YouTube channel that contains projects of all sizes, tips & tricks, many level design tutorials, and speed level design challenges using Unity and Unreal Engine. Brackeys is another excellent gamedev channel with lots of Unity tutorial goodness, including 2D projects, multiplayer projects and C# scripting. We have our own YouTube channel, called VirtualRealities.school in which we cover topics around 3D character tools, VR development, and general Unity content. Anybody who prefers written content and images over videos can find a selection of tutorials in this section. Firstly, Unity has its own wealth of written tutorials, tips and tricks that will help any developers immensely. Unity's manual is hands-down the best text-based Unity resource there is. If you haven't read the manual yet, make it your first read before moving on to any other materials. Closely linked to the manual is Unity's Script Reference - while it may not be the most exciting read for some, it's indispensable. Unity How-To: Common Mistakes To Avoid is an excellent collection of tips by Unity field engineer Valentin Simonov. Unity UI Optimization Tips is another wealth of information for optimization by Unity engineer Ian Dundore. Definitely read these collections of wisdom before you start any new projects. These posts are part of Unity's Creator's Corner/Developer's Corner, several collections of articles with very similar purpose and with lots of great insights and developer advise. The Unity Blog features a great collection of Unity news, feature previews, insights, and interesting articles - definitely worth following. Catlike Coding is a classic among text-based Unity tutorials, mostly focusing on shaders, rendering, and C# for Unity. The tutorials are created for Unity 2017.1. Noobtuts is an excellent collection of text tutorials of 3D and 2D games, some of which are free and some are premium content available for $20. While these tutorials use Unity 5 (from 2015/16), many of the tutorials are still relevant today. Check out the free samples and see whether you like the clean, concise style of these tutorials. Gamasutra's blog is a fairly busy space, but somewhat regularly contains useful posts that are basically condensed mini-tutorials. Given that posts are published by a variety of authors, your mileage may vary when it comes to quality and conciseness. With a bit of patience and luck in your search, you might find some hidden gems that will solve the exact Unity-related problem you are facing. One of these gems is a list of 50 Unity Tips&Tricks by Herman Tulleken - while this list is a bit older, it contains lots of great information. Ray Wenderlich has a a wide range of free and excellent text-based tutorials that are easy to follow along thanks to clear instructions and gif images. Everything from introduction tutorials to VR, 2D, multiplayer and many other topics are covered. Some tutorials are a few years old already, but you will surely get some value from this tutorial collection. Somewhere between text-based and image/gif tutorials is the Twitter hashtag #UnityTips. Some tweets might be completely useless, but there are so many small Aha-moments sprinkled in there, that the search is well worth it. You are sure to learn neat little features of Unity that you had no idea existed. I started to collect a few of them here. Sarthak Gosh published an excellent written tutorial on using the new SteamVR 2.0 Input system with Unity. The tutorial can be found on Medium.com.